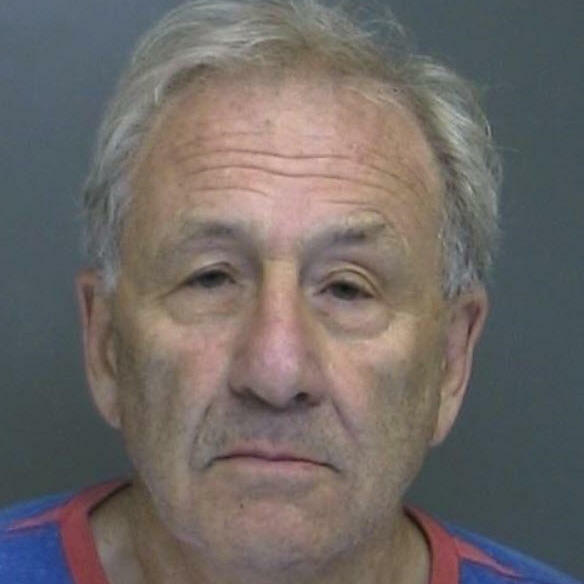 Suffolk County police say Martin Astrof nearly backed over a campaign worker after saying he wanted to kill supporters of President Trump and U.S. Rep. Lee Zeldin, both Republicans. A man almost ran over a campaign volunteer with his car after threatening to kill supporters of President Trump and Rep. Lee Zeldin at the New York Republican congressman's campaign headquarters on Long Island on Friday, police said. Martin Astrof, 75, confronted a campaign worker at Zeldin's campaign office in Nesconset on Friday morning at 11:15 a.m. ET, according to Suffolk County police. "After threatening to kill the campaign worker and other supporters, Astrof backed his car up in an aggressive manner nearly striking the worker," a police statement read. Astrof left and was arrested outside his home in Nesconset shortly after. In a tweet, Zeldin identified the campaign worker as Donato Panico. Astrof has been charged with making a terroristic threat and reckless endangerment, police said, and he was jailed overnight awaiting an expected arraignment on Saturday. The New York Daily News reports that Astrof's lawyer declined to comment on the case. Zeldin, who has represented New York's 1st Congressional district since 2015, decried the attack on Twitter. He says he has received threats since Trump was elected, according to the AP. "In the US, political scores are settled at the ballot box, not by trying to kill your political opponents," Zeldin tweeted on Friday. "Donato Panico is a great American, supporter of @realDonaldTrump & one of my campaign vols. He shouldn't have been targeted like this today for his passion & involvement." Zeldin is running for a third term against Democratic challenger Perry Gershon, a former commercial real estate lending executive, in the Long Island district that Trump won by about 12 points.